When downloaded the Remote Desktop Manager (RDM) is exists of a single executable that starts an installation procedure. During the installation procedure the only question is the destination location for the files. The installation is actually just creating the directory and copies the executable into this directory. So if you have installed the program and copy the executable to another workstation you just can start the application. 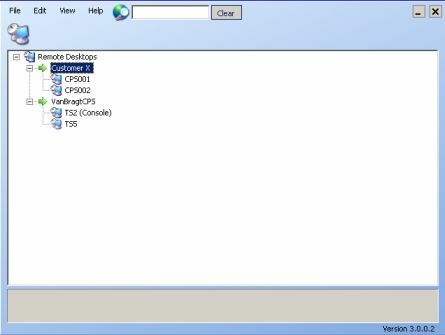 RDM is a kind of assembly point and is using the standard software for the creating the connection so the systems, so you need Microsoft Remote Desktop Client and/or RealVNC client. Beside those client .Net Framework 2.0 is required for RDM. The program is started using the RemoteDesktopManager.exe file. By the right mouse button a menu will be displayed where the options are displayed for managing the connection. Addition of a connection can be done via the Add session option where you can configure all the settings manually. 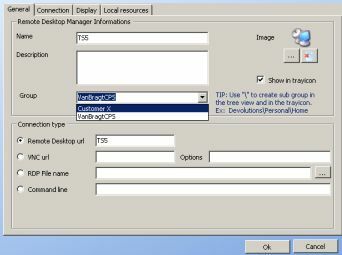 The other possibility is to import with a RDP file where all the settings are already available (RDP session). Already available connections can be edited, renamed or exported. When you create a export a RDP file is being created. Creating or editing an connection will give you several configuration options on four tabs. On first tab the most basic settings can be found like the display name and the way the connection should be setup (Remote Desktop, RDP File, VNC Url or a special command line). Also you can divide the connections into groups. On the second tab connection you can specify the username and domain (so these are filled in automatically) and if you would like to connect to the console session. At the Display tab logical several settings (also some performance settings) can be found concerning the way the desktop session is functioning. On the last tab Local Resources (for example printers, drivers, printers and smartcards) can be configured to be connected within the session or not. A session can also be cloned, so you have to change the display name and the connectionmethod. Beside the configuration of the connections, there are also some other general settings that can be configured. For example the way the application is started and how the User Interface is showed and functioning. The Remote Desktop configuration is stored in an Access based database, which can be stored on a file share, so the connections can be shared between administrators. If you do not want to share the database, there is also an option to export and import the whole configuration in another database. When all the connections are configured RDM is single point of contact to start Remote Connections. There are two options to start the Remote Connections: via the GUI or via the tray icon. This tray icon is a really nice feature, because it is really easy to access all your connection whatever which applications are running currently on your desktop. Also a nice feature is the search option in the GUI. Just fill in some characters of the connection name and only those who will match those characters will be displayed. Different with the other Remote Connections manager product is the way the session is started. Most products open these in their own Window within the application, but RDM just opens the default RDP client (which is full screen by default). I think it depends on the usage of Remote Connection which method is preferable. The RDM is a concentration point for Remote Connections where besides RDP connections also VNC connections can be grouped. Within the RDM I really like the Tray Icon, the search options and the shared database, but there are also some options missing like the possibility to fill in connection properties for a group. If you are using RDP connection the whole day you probably like other products like vRD a bit more, because of the way the connection is displayed.